1 Departamento de Producción Agrícola, Facultad de Ciencias Agronómicas, Universidad de Tarapacá, Arica, Chile. 3 Departamento de Biología, Facultad de Ciencias, Universidad de Tarapacá, Arica, Chile. dlaime@uta.cl. Abstract: We report the first genetic analysis of archeological maize specimens from the site of San Lorenzo (1,500-700 BP) (Azapa valley, Arica, Chile). Ancient DNA was successfully isolated from 11 archeological maize grains. The Alcohol dehydrogenase 2 (Adh2) gene was analyzed because it has a highly variable region due to the presence of a microsatellite region around -28 to -8, which consists of GA repeats that may be present in three types GAn, GAnTA and GA1AA1GAn, which is used as an informative region of the routes of initial dispersion of maize. Five Adh2 alleles were obtained and the alignment of these sequences according to the variable region revealed the presence of the three types of GA repeated. Our results do not provide sufficient evidence to reject any maize spread model proposed. This is the first report focused on genetic analysis of maize associated with an archeological site in Chile. Key words: Ancient DNA (aDNA), archeological maize, San Lorenzo, northern of Chile. Resumen: Este trabajo reporta el primer análisis genético de maíces arqueológicos del sitio San Lorenzo (1.500-700 BP) (Valle de Azapa, Arica, Chile). Se aisló de forma exitosa el ADN antiguo de 11 granos de maíces arqueológicos. Se analizó el gen de la Alcohol dehydrogenase 2 (Adh2), debido a que posee una región altamente variable por la presencia de un microsatélite entre el -28 y -8, la que consiste de un repetido de GA que puede estar presente en tres tipos; GAn, GAnTA y GA1AA1GAn esta es utilizada como una región informativa de la ruta inicial de la dispersión del maíz. Se obtuvieron cinco alelos del gen Adh2 y el alineamiento de dichas secuencias, de acuerdo con la estructura de la región variable, reveló la presencia de los tres tipos de repetido de GA. Nuestros resultados no proveen suficientes evidencias para rechazar ningún modelo propuesto de dispersión del maíz. Este es el primer trabajo en Chile enfocado en el análisis genético de maíces procededentes de contextos arqueológicos. Palabras claves: ADN antiguo (ADNa), maíz arqueológico, San Lorenzo, norte de Chile. Maize (Zea mays ssp. L. mays) is a principal domesticated crop of the Americas, originated from one or more varieties of teosinte. Although its origin in Mesoamerica has been established, its time of arrival and trajectory of spread through South America is still uncertain (Benz 2001; Matzuoka et al. 2002a; Lia et al. 2007; Staller and Thompson 2002). According to the archeological record maize was present in Central America around 6,250 years BP (Benz 2001; Piperno and Flannery 2001). However, its presence in South America has not been clearly established; direct archeological evidence indicates that its presence has been estimated between 4,500 years BP (Freitas et al. 2003; Pope et al. 2001). In South America, the spread pattern of maize has been inferred from cytogenetic and genetic studies with several results (McClintock et al. 1981; Matzuoka et al. 2002a; Freitas et al. 2003; Lia et al. 2007; Babot 2011; Grimaldo 2011). Using cytogenetic studies based on the calculation of the frequencies and distribution of chromosome components, such as B-type chromosome, abnormal chromosome 10 and chromosome knobs, McClintock et al. (1981) suggested that maize was initially introduced into the central Andes and from there it spread to other highlands and lowlands in the continent, without being supplemented by other types of maize until new genotypes spread along the eastern Brazilian coast in recent times. Structural and phylogenetic analysis based on 193 and 752 maize accessions from eastern Canada to northern Chile using 99 and 96 microsatellites, performed by Matzuoka et al. (2002b) and Vigouroux et al. (2008) respectively, indicated a second model in which maize was spread into South America via Colombia and Venezuela and the Andes were populated from Colombia (Vigouroux et al. 2008). Ancient DNA (aDNA) from maize recovered from archeological remains may play a role in our inference of its spreading. Genetic analysis of the short segment of Alcohol dehydrogenase 2 (Adh2) from primitive landraces and preserved maize remains from eastern Brazil, Peru and northern Chile shows the presence of three allele groups differentially distributed within South America, supporting a third model with two separate expansions of maize spreading. One expansion came from highlands Central America into the Andean region and a second expansion along lowlands of the northeast coast of the continent (Freitas et al. 2003). On the Pacific side the maize cultivation reached a large part of Chile, morphological analysis has been performed in some of these archeological samples; unfortunately, maize from Cabuza, a burial site on the northern coast of Chile, has only been analyzed genetically (Goloubinoff et al. 1993). In Chile the earliest evidence of maize comes from Tiliviche Site 1b, located in the Tiviliche ravine 35 km from Pacific coast (Núñez 1986). According to Núñez and Moragas (1977), stratigraphic evidence initially suggested that leaves and cobs of maize were found dated around 7,850 BP and 6,060 BP (uncalibrated), corresponding to the Piricinco coroico complex, linked to tropical lands of eastern Bolivia (Núñez and Moragas 1977). However this kind of indirect dating is becoming a significant problem because the association between the material used for dating, such as wood charcoal, and the maize macro remains are not always secure (Long et al. 1989). Performing direct dating through accelerated mass spectrometry (AMS) approach on maize macro remains from early deposits of the Tiliviche site, Unit-2, showed that these were dated around 1,000 BP (Rivera 2006). Currently in Chile 23 maize races have been identified, most of them grow in the northern regions such as Harinoso Tarapaqueño, Limeño, Chulpi, Polulo, Capio chileno grande, Capio chileno chico, Chutucuno, Morocho Amarillo, Negrito chileno, Marcane and Curagua among others (Paratori et al. 1990). Since maize samples recovered from archeological sites are not always well-enough preserved for a morphological or racial identification, ancient DNA is an important tool for understanding the history of the domestication and spreading of maize cultivation in South America (Lia 2007; Schlumbaum et al. 2008). In northern Chile there is an enormous variety of maize landraces and several archeological sites with maize samples directly dated up to 2,210 years BP (Blake 2006), however there is only one genetic study on ancient maize (Goloubinoff et al. 1993). In this study we analyzed archeological maize seeds associated with funerary remains from the site of San Lorenzo (1,500-700 BP (Muñoz 2004)) and local modern maize landraces were analyzed for the short and highly variable region (microsatellite) present in the Adh2 gene. The site of San Lorenzo, in the Azapa valley (Arica, Chile), is probably first administrative site of all northern Chile (Muñoz 2004; Muñoz and Focacci 1985). San Lorenzo maize samples could contribute new evidence to unravel which maize expansion model into South America occurred. Collection sites, ID, age, type of remains and context of the individuals examined in archeological and modern maize landraces are described in Table 1. The location of archeological site is shown in Figure 1. Archeological samples were dated between 1,200 -1,000 BP (Muñoz 2004). The samples correspond to 20 maize grains found in funerary remains in San Lorenzo site 11 (SL) located in the Azapa valley (Arica, Chile). 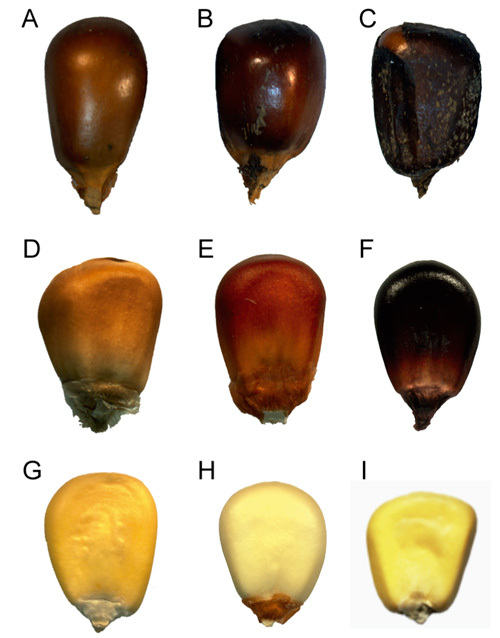 These grains show differences in seed coat colors, suggesting that they come from different types of maize (Figure 2). The modern samples correspond to grains of local maize landrace from the Lluta, Socoroma and Camiña valleys (Chile) and Pachía valley (Peru) (Figures 1 and 2). The ancient DNA extraction and PCR setup were performed in a laminar flow hood (ESCO laminar flow) in a laboratory dedicated to this purpose. All equipment was first wiped with bleach (10%) and then exposed to UV light for at least 1 h inside the laminar flow hood. Stringent measures were taken to prevent contamination with modern maize DNA. To remove external contaminant sources of DNA, archeological seeds were washed in 10% bleach for 5 minutes, rinsed with sterile and deionized H2O and dried at room temperature under laminar flow hood. The seed coat was removed using a scalpel; following this each seed was powdered in a mortar and placed in an Eppendorf tube. Nucleic acids from archeological grains were extracted using the Qiagen DNA extraction kit and Insect DNA kit (Omega-BioTek), according to the manufacturers’ instructions with minor modifications (unpublished results). Elution of DNA was repeated twice with 50 ml of ddH2O each time. Table 1. Maize samples used in this work. Muestras de maíz utilizados en este trabajo. a SL, San Lorenzo sitio 11; Ll, lluteño maize; Soc, Socoroma maize: Cam, Camiña maize; Pa, Pachía maize. b Context from which samples were recovered: F, funerary. Socoroma valley; Camiña valley; Pachía valley. Valle de Socoroma; Valle de Camiña; Valle de Pachía. Nucleic acid extraction from modern maize landraces were performed using the cetyltrimethylammonium bromide (CTAB) method as described by Doyle and Doyle (1990). The modern DNA was extracted in a separate laboratory. The PCR setup was performed in the same laminar flow hood used for the aDNA extraction, using dedicated pipettes and aerosol barrier tips. Equipment was wiped with bleach and then the equipment and reagent tubes were exposed to UV light for at least 1 h before setting up the mix. PCR reactions were performed in a final volume of 20 ml. Each reaction contained 3 ml of DNA extract, 10 pmoles of each Adh2 primer (Table 2), 2.5 mM of each dNTP, 2 mM MgCl2, 1X PCR buffer ((NH4)2SO4), 5 units of Taq DNA polymerase (Fermentas) and sterile double distilled water. Cycling conditions were: 10 min at 94 oC; 40 cycles of 1 min at 94 oC; 1 min at 48 oC; 1 min at 72 oC and a final elongation step of 10 min at 72 oC. PCR reactions incorporated one PCR blank reaction for each primer. Five ml of each PCR product was visualized on 2% agarose gels stained with gel-red (Biotium). Reactions containing fragments of the expected size were directly sequenced by a commercial facility (Macrogen, South Korea); samples SL-2.2 and SL-3.2 were re-amplified using 1 ml of the PCR reaction under the following conditions: 10 min at 94 oC; 35 cycles of 30 sec at 94 oC; 40 sec at 50 oC; 40 sec at 72 oC and final elongation step of 2 min at 72 oC. Modern maize samples were amplified using 200 ng of DNA and Adh2UM-long primers under the following conditions: 5 min at 94 oC; 35 cycles of 30 sec at 94 oC; 30 sec at 55 oC; 30 sec at 72 oC and a final elongation step of 2 min at 72 oC. Reactions containing fragments of the expected size were directly sequenced by a commercial facility (Macrogen, South Korea). All sequences were edited and then aligned by the CLUSTAL W method implemented in MEGA 6 (Tamura et al. 2013). Twenty archeological maize grains from funerary remains in San Lorenzo site were used for ancient DNA extraction, Figure 2. Two DNA extraction kits were used to isolate aDNA and better results were obtained with the Bio-Tec protocol with minor modifications (unpublished results). Ancient DNA was successfully amplified by PCR in 11 grains, obtaining amplicons of the expected size; these samples were selected for direct sequencing. Good sequences were obtained from 5. In the remaining 6 samples it was not possible to reconstruct the Adh2 fragment. DNA extracted had a low molecular weight under 150 bp, because PCR amplification fragments were obtained using either Adh2UM or Adh2-S2 primers, which amplify fragments of 108 and 143 bp, respectively; we did not detect PCR products using the Adh2UM-long primer, which amplifies a fragment of 220 bp. No PCR products were obtained in any negative control (data not shown). Six modern maize landraces (Figure 2) cultivated in the Lluta, Camina and Socoroma valleys (Chile) and in the Pachia valley (Peru), located around the San Lorenzo archaeological site, were analyzed by PCR using Adh2-S2 primers and a fragment of 143 bp was sequenced for each sample. Short Adh2 fragments from the archeological samples and modern landraces were aligned. A feature of the sequence amplified is the presence of a microsatellite region around -28 to -8, which consists of GA repeats that may be present in three types GAn, GAnTA and GA1AA1GAn (Goloubinoff et al. 19923; Freitas et al. 2003). All three types of repeats were found in the samples examined (Figure 3). Table 2. Primers sequences and predicted product lenghts. Secuencia de los iniciadores y longitud de los productos esperados. Figure 3. Alignment of 11 Adh2 sequences obtained from five archeological and six modern maize samples. The stretch of microsatellite repeat appears highlighted in yellow. Letters in red correspond to polymorphisms. Alineamiento de las 11 secuencias de Adh2 obtenidas de cinco muestras de maíz arqueológico y seis muestras de maíz moderno. La región del microsatélite se muestra resaltado en amarillo. Las letras en color rojo corresponden a polimorfismos. Three archeological maize grains SL-1.1, SL-2.1 and SL-3.1 presented the dinucleotide GA repeat type GA5; one grain SL-2.2 and one grain SL-3.2 showed the dinucleotide GA repeats type GA1AA1GA7 and GA4TAp respectively (Figure 3). Additionally, archeological sequences reveled sequence variations at a total of three single nucleotide positions and another three positions where it was not possible to identify the correct nucleotide (Figure 3). The modern maize sample from Camiña Valley presented the GA4TA: type dinucleotide repeat; maize from Socoroma valley had the GA5, GA4TA1 and GA1AA1GA7 types; the maize from Lluta valley presented the GA8 type and maize from Pachía valley showed the GA4TA1 type (Figure 3). According to Muñoz and Focacci (1985) consider to settlement of San Lorenzo as a large village who would have been an administrative center in the lower area of Azapa Valley. This hypothesis is due to San Lorenzo is placed in a strategic location in the valley, its architectural features, its square, territorial expansion, large number of venues, perimeter walled, cemeteries and road networks among other. These make it a nuclear space of multiple economic and social relations. San Lorenzo agricultural development peaked between 1,2101,020 BP (Muñoz 2004). Apart from being an administrative center, San Lorenzo was also a passage where various goods were transported, including maize, from the Peruvian coast (Núñez 1976). Good water quality of the Azapa valley may have been the principal interest for initiating maize cultivation, for example, the Tiwanaku culture used these water resources for fruit farming development, which did not occur in other valleys located in the area that have salty water. Currently evidence suggest that maize is grown in the coastal valleys of the Pacific, during the Formative period, around 3,000 B P. According to Rivera (1980) during this period is the beginnings of peasant farming process and the introduction of Capio maize race. During 1,400 to 1,200 BP, the maize would have constituted the basis of the late village sedentary populations and addition, a probable center of diversification in meridional Andean area, from which Northern Chile was part (Rivera 1980). These events may have initiated the interest of San Lorenzo’s farmers to cultivate maize in this semitropical valley, which gave rise economic development and the appearance of an administrative center. According to maize cobs analysis, these were identified as Piricinco/Coroico race (Muñoz 2004), a floury maize race widely distributed in South America (Grobman 2013). The recovery of DNA from archeological maize grains from funerary remains demonstrated good genomic DNA preservation and is quite encouraging for future research. The results also indicate that it is highly unlikely that any of the data derived from contamination from external modern maize DNA. No PCR control showed any cross contamination. Independent replication of aDNA analyses is suggested to ensure the quality of data and conclusions (Cooper and Poinar 2000; Pääbo et al. 2004), however we subscribe to the view of Gilbert et al. (2005), in which aDNA research should be validated using a cognitive approach. As the PCR controls did not show evidence of any contamination, including control re-amplification reactions, and the samples clearly yielded maize genomic DNA sequences, it is very unlikely that our results derive from contamination, thus they do not require independent validation. It was not possible to obtain amplification products greater than 145 bp in archeological samples, which agrees with previous reports, because DNA in archeological samples is generally degraded to small sizes (Jaenicke-Després et al. 2003), besides the amplification of alleles by amplicon size circumvents problems caused by diagenetics modifications when nucleotides polymorphisms are typed in aDNA (Lia et al. 2007; Paabo 1989). The sizes of Adh2 fragments amplified were consistent with the sizes previously reported (Freitas et al. 2003; Grimaldo 2011). Three archeological samples showed the presence of the simple dinucleotide GA repeat type GA5, one sample presented the type GA1AA1GA7 and one sample had the type GA4TA of this microsatellite. There was not relation between the seed coat color of the maize grain associated to a specific microsatellite. The three types of this GA repeat were also found in the six modern land races analyzed. Maize from the Lluta and Socoroma valleys had the type GAn (n=5-8). A second maize sample from Socoroma valley showed the type GA1AA1GA7 and maize samples from Socoroma and Pachia valleys presented the type GA4TA (Figure 3). In relation to Adh2 sequences, the microsatellite analysis, suggests lightly a linking between archeological and modern samples from the highlands. Analysis of archeological samples from other sites around Azapa valley will be necessary for evaluate this linking. Modern maize samples show differences between lowland and highland maize. The Lluta valley is a coastal valley, while the Pachia valley is over 1500 m elevation; the Socoroma and Camina valleys are in the Andes region at around 2,000 m. Lluteno maize has the longer dinucleotide GA repeat type GA8, while Andean maize has the three types GA5, GA1AA1GA7 and GA4TA1. The type GA8 is associated mainly with samples from near the coast (Goloubinoff 1993; Freitas et al. 2003; Grimaldo 2011). Lluteno maize presents the allele GA8 type is similar to archeological maize from coastal Peru (Goloubinoff 1993; Grimaldo 2011). The three AG repeat types present in Adh2 gene described above have different distributions within South America and have been found in modern maize cultivars from North America. In addition, the presence of the GAn and GAnTA types in the teosinte varieties Z. m. mexicana and Z. m. parviglumis suggests that the presence of these three repeat types in South America is due to introduction of these genotype to the highland from Central America rather than diversification of an ancestral genotype within South America (Freitas et al. 2003; Goloubinoff et al. 1993). A different view was proposed by Freitas (2003), who suggested that two introduction events of maize into South America occurred, one from highland of Central America into the Andes region and a second event along the lowlands from Central America into lowlands of the northeast coast of South America (Freitas et al. 2003). This model was supported by Vigouroux et al. (2008), through a more comprehensive study of microsatellites in modern landraces. The model proposed by Freitas et al. (2003) is supported by the unequal Adh2 allele distribution in South America. The GAn allele was identified mainly in western sites, while the GAnTA and GA1AA1GAn alleles were found along eastern area of South America. Nonetheless, in a subsequent study analyzing a larger number of archaeological sites in western areas Grimaldo (2011) reported a wide distribution of all three AG repeat types, however the type GAn was associated mainly with samples from the western area and the types GAnTA and GA1AA1GAn were found along eastern area of South America. Currently, in modern maize these alleles are widely distributed in South America, except the type GAn which is present at low frequency at the eastern side of South America (Freitas et al. 2003 and Grimaldo 2011). In our study, Adh2 gene analysis is still not enough to assign clearly the ancient samples to a modern variety probably the small ancient sample size is an inevitable constraint of this kind of studies (Lia et al. 2007) and because there is not genetic analysis available to ensure these modern landraces have not been affected by movement of commercial germplasm or interbreeding between landraces during post-Columbian period. However, our results are pertinent and useful to establish the implications for the maize cultivation spread into South America. In the archeological maize samples from the site of San Lorenzo we found all 3 AG repeat types described for Adh2 gene. Our results support and complement the model proposed by McClintock (1981), in which maize was initially introduced in the central Andes and then spread extensively throughout the highland and lowland areas of South America. Also, our results are concordant with two maize expansion model proposed by Freitas et al. (2003), which there was mixing of genotype between east and west of South America, the meeting ground of theses two expansions, between the northern Chile, where the samples under study come from and Paraguay. This meeting ground is supported by the results of Lia et al. (2007) for Andean origin of some Argentinean races who, analyzing three microsatellite loci, found that archaeological samples from Northwestern Argentina possessed alleles specific to Andean races. Our results do not provide sufficient evidence to overturn any maize spread model proposed. Archeological evidence suggests that in Chile maize may have appeared between 7,850 and 3,000 BP, but agriculture did not become established until 1,600 BP (Núñez and Moragas 1977; Pope et al. 2001; Freitas et al. 2003). The discrepancies in the dating to establish the presence of maize on Chile is due to the first measurements were performed by indirect stratigraphic approaches (Nunez 1986; Nunez and Moragas 1977; Schiappacasse and Niemeyer 1984). Indirect dating involves a significant problem because the association between the material used for dating and the maize macro remains are not always secure (Long et al. 1989). A new chronological history should be reconfirmed with new radiometric dating obtained directly from maize and evaluate the stratigraphy where these samples were found. This is the first report focused on genetic analysis of maize associated with an archeological site in Chile. 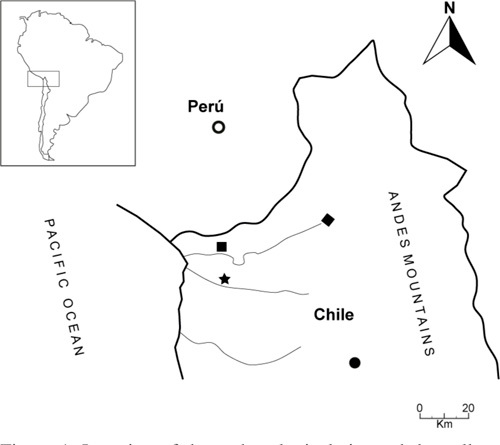 Due to the large number of archeological sites in northern Chile where maize remains may be found (Rivera 2006), these types of studies are necessary for understanding the ancestral route of maize cultivation in Chile. Acknowledgments: We are especially grateful to Claudia Grimaldo Giraldo for critical comments on the manuscript. This research received support from Fondecyt 11100492, Fondecyt 1130249, UTA-Mayor 4710-13 and Convenio de Desempeño en Educación Superior Regional UTA-1401. Finally, we would like to thank the anonymous reviewers for their relevants comments which were very helpful and enhanced this work. Recibido: mayo 2014. Aceptado: septiembre 2015.